GAFTA (The Grain and Feed Trade Association): GAFTA has been set out to promote international trade and protect the interests of its members especially for grains and feed trading. Their activities have been included for definition and regulation of quality standards, weighing rules, sampling, analysis and insurance. 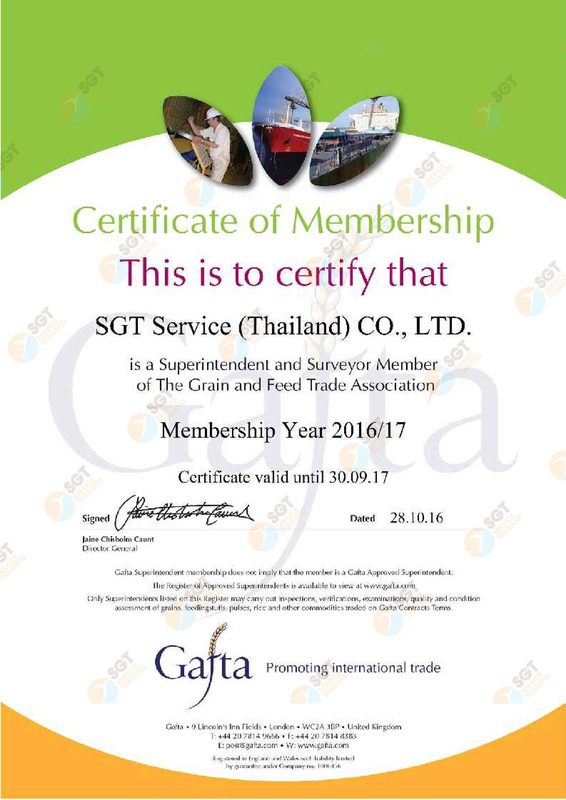 By which SGT is one of the approved superintendent of GAFTA, so we can issue Certificate of Quality for Grain and Feed both import and export from Thailand. 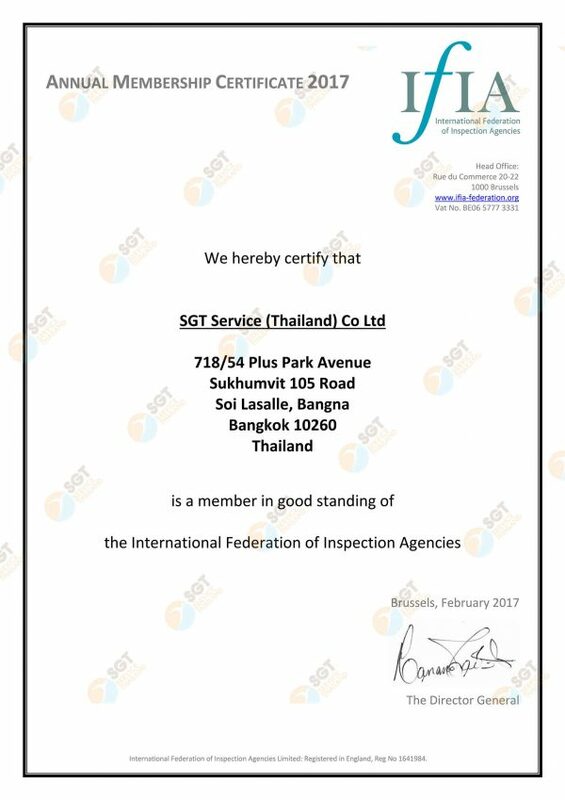 IFIA (International Federation of Inspection Agencies): We are also the first and only one Thai Superintendent Company that has joined the International Federation of Inspection Agencies (IFIA), as their member, whose certification is accepted worldwide and has set up the working standard for IFIA members. By which it is highlighted on occupational behavior’s standard, code of ethics and fairness in serving customer; this is our core value for SGT team as well. 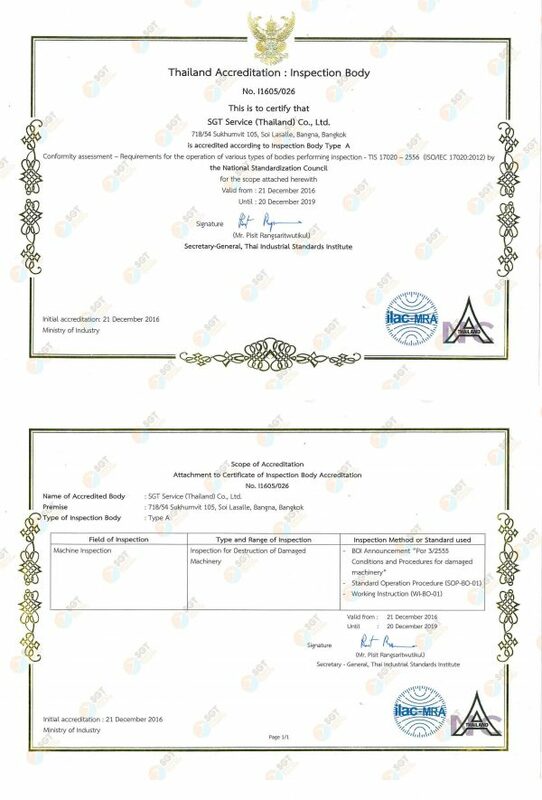 AFAS (Australian Fumigation Accreditation Scheme): SGT Service (Thailand) Co., Ltd has been certified as Offshore Methyl Bromide Treatment Provider in Thailand for AFAS (Australian Fumigation Accreditation scheme), Australia which is regulated and controlled by Department of Agriculture, Fisheries and Forestry (DAFF). We then can provide fumigation service as per standard of importing countries like Australia. By which our qualified fumigators have also passed the training both the international standards and Department of Agriculture, Thailand standard as well. 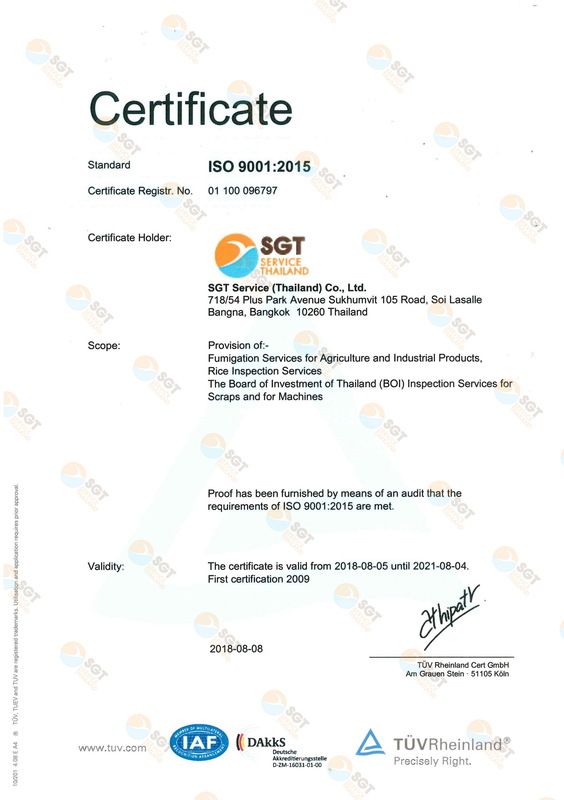 ISO 9000:2015 System Standard for Quality Management: Apart of being certified for trade regulations and associations, SGT Service (Thailand) Co., Ltd has also well aware on the importance of Quality Management’s Principles. We have been certified for ISO 9000:2008 and up to presently as ISO9001-2015. ISO/IEC 17020 Regulation Standard for Inspection Body: To level up the standard of our inspection services, SGT Service (Thailand) Co., Ltd has been certified for ISO/IEC 17020 by The National Standardization Council for BOI inspection service which has not only represented the fairness and competences but also the management system to monitor internal inspection body to perform in the effective and efficiency way. IPPC & ISPM No. 15: The International Plant Protection Convention (IPPC) has been approved by The FAO (The Council of the Food and Agriculture Organization of the United Nations) in order to secure effective action and prevent the spread and introduction of pests of plants and plant products and to promote measures for their control. By which ISPM No. 15 is regulated by IPPC to describe globally the accepted Phytosanitary measurement to manage the risk of pests associated with wood packaging material, in use international trade. SGT Service (Thailand) Co., Ltd has foreseen the important role of supplying wood packing which has sufficient processing or treatment to remove or kill pests. By which we can supplied wooden pallet with IPPC symbol mark. Motor Vehicle Inspection Program (MVIP) for exporting to Australia: In 2009 the Australian Department of Agriculture and Water Resources and the Thai Department of Agriculture (DOA) signed an agreement on the Motor Vehicle Inspection Program (MVIP) which was designed to facilitate the inspection and certification of new vehicles sent from Thailand to Australia. When biosecurity risk material is detected on new vehicles arriving in Australia, they are ordered into biosecurity control and sent for treatment. The common biosecurity contamination of new vehicles includes weed seeds, dried leaves, soil, insects and bird droppings. SGT Service (Thailand) Co., Ltd is an accredited inspector to ensure new vehicles are being inspected in a manner consistent with the department’s standards.